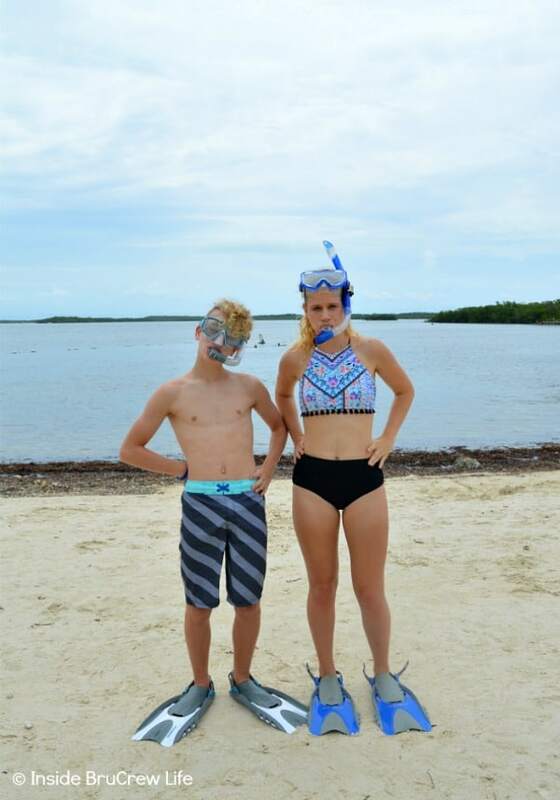 One of our first family trips this summer was to find Fun Things to do while Driving the Florida Keys. We packed our bags, loaded up our vehicle, and set out to find food and adventures along the islands. 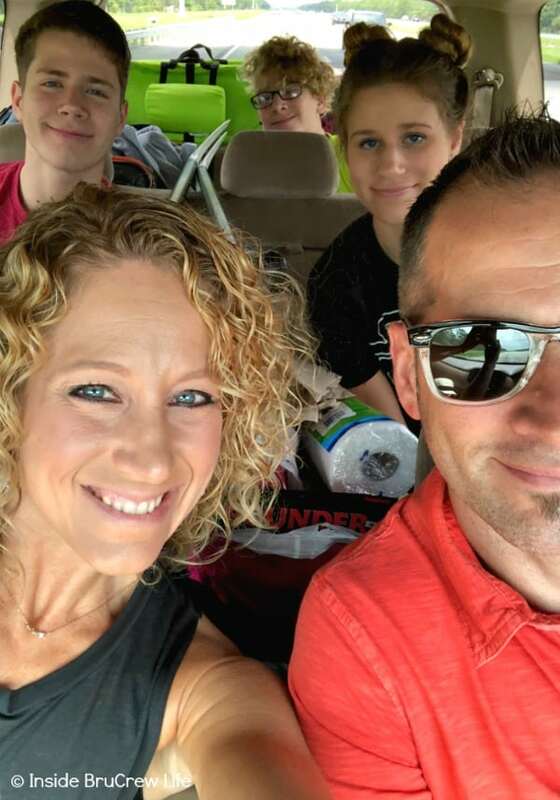 Earlier this summer we decided to take a big week long family vacation. 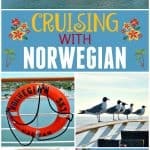 Our kids love cruising, so we booked one that had four stops in the Western Caribbean. Four days before the boat was to set sail, we found out that the boat had to have maintenance, and the itinerary had changed to two ports. 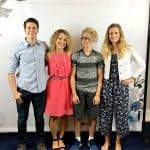 When we are paying that much money for a 7 day cruise, we were not ok with spending 3 days in Tampa. Especially since we live close to there and can go any time we like. 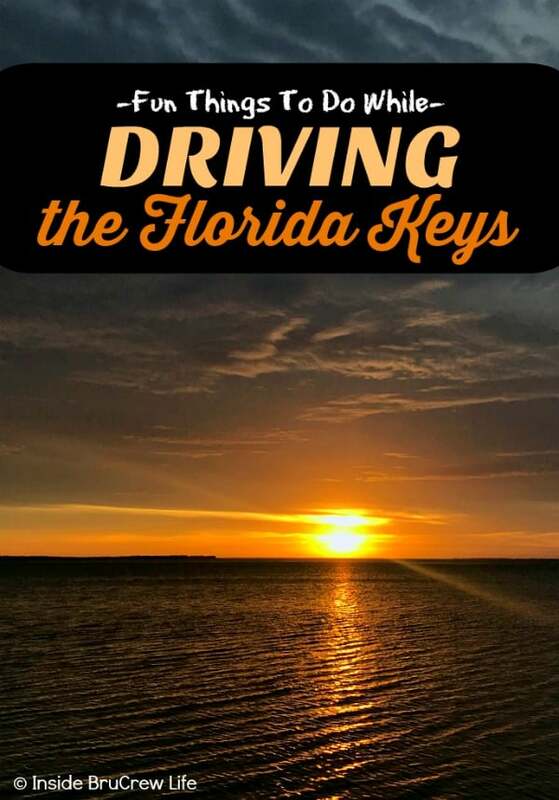 Since driving the Florida Keys has been on my husband’s bucket list for quite some time, we scrambled to cancel that particular cruise and planned a quick road trip through the Florida Keys and a short three day cruise from Tampa. It wasn’t what we were planning, but hey, we are learning to roll with the punches and not get bent out of shape when things don’t go the way we plan. 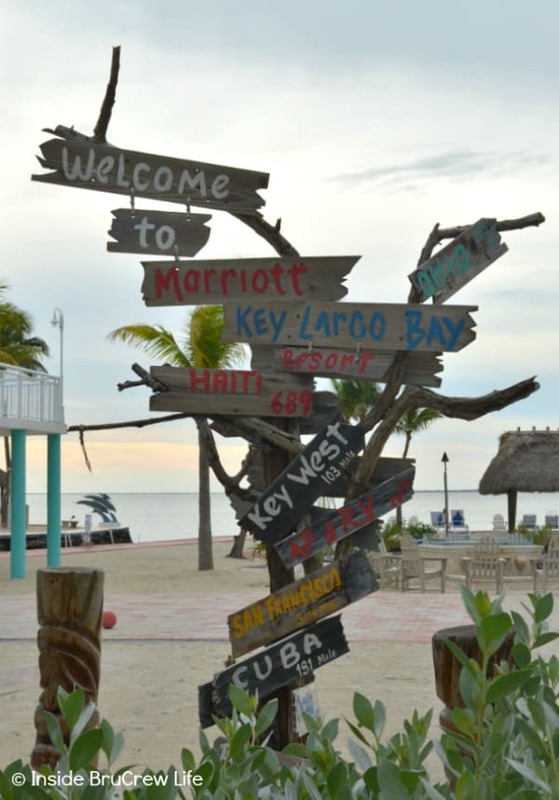 The trip from Miami to Key West will take you along 159 miles on the Overseas Highway. This two lane road crosses 42 bridges before you reach mile marker 0. I wish I could tell you our drive was magical, and that we saw crystal clear aqua blue water and pretty palm trees along the way. It was actually stormy and rainy most of the time we were driving through each island, so we didn’t see as much as we thought we would. I guess that means another trip will need to happen again. Not a bad thing at all, right? 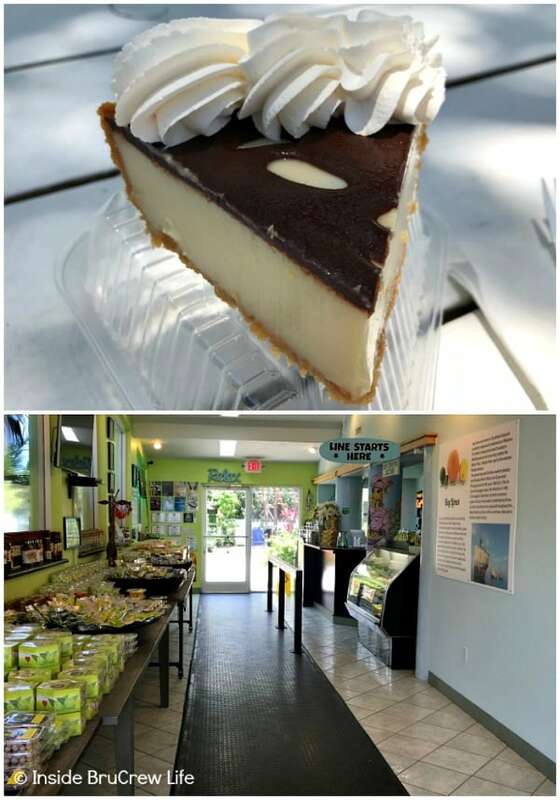 After all, I’m all about finding the best key lime pie, so I think we should go again and hit some more places to eat. 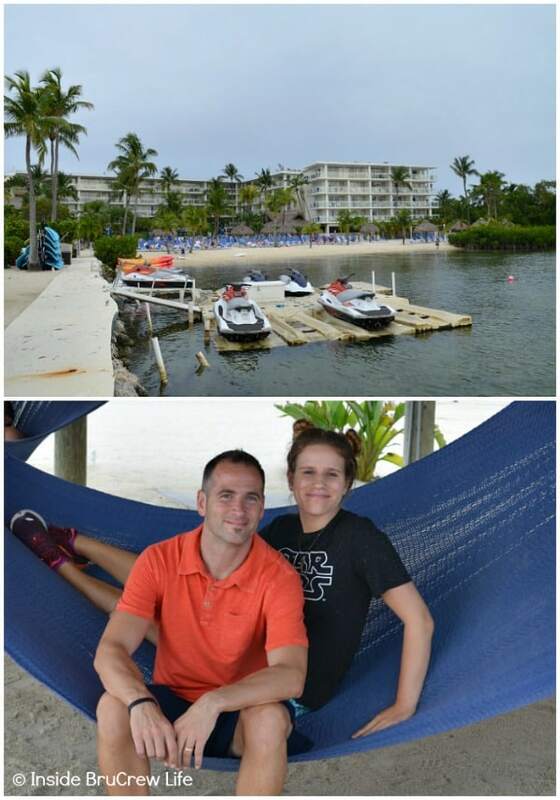 The first day we drove from our house down to Key Largo Bay where we stopped for the night at the Marriott Beach Resort located at mile marker 103.8. 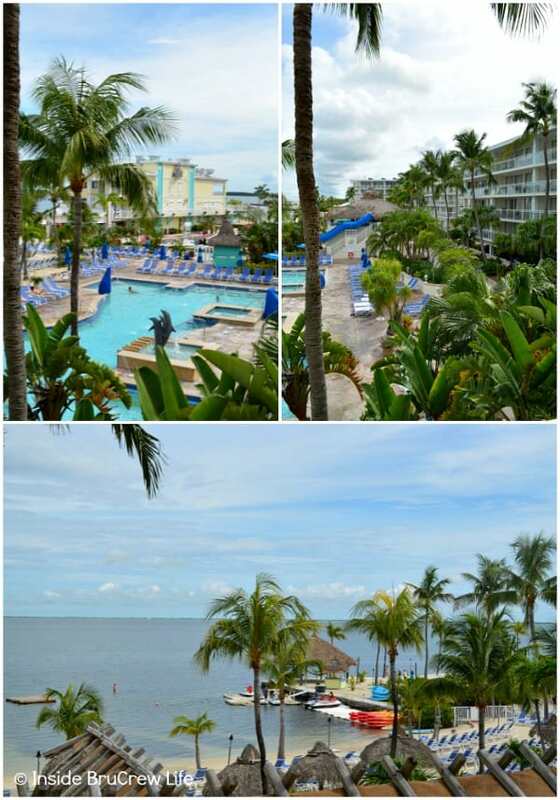 This pretty beach resort has lots of food and activities for everyone on the 17 acre waterfront property. After dinner we walked around the resort enjoying the views, played a few games of corn hole, then ended the night with drinks while watching the sun set over the water. Dinner that night was from Mrs. Mac’s Kitchen. 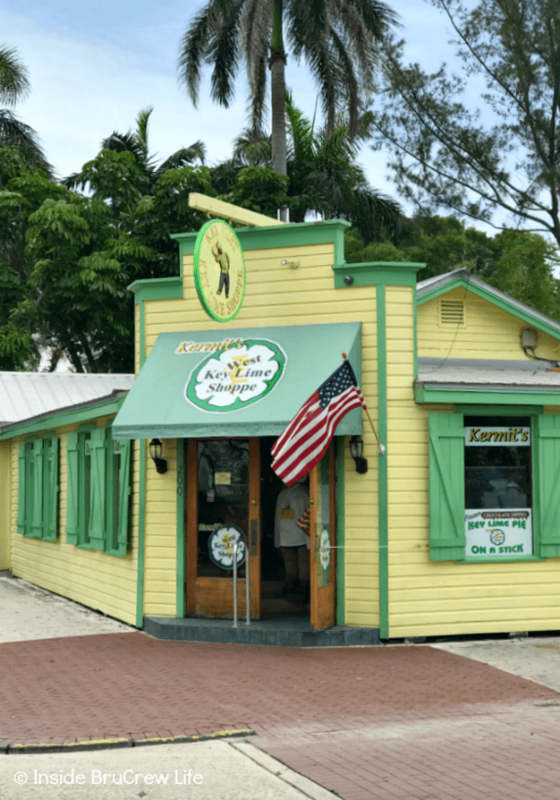 This fun little eatery is the longest running restaurant in Key Largo, so of course we had to check it out. 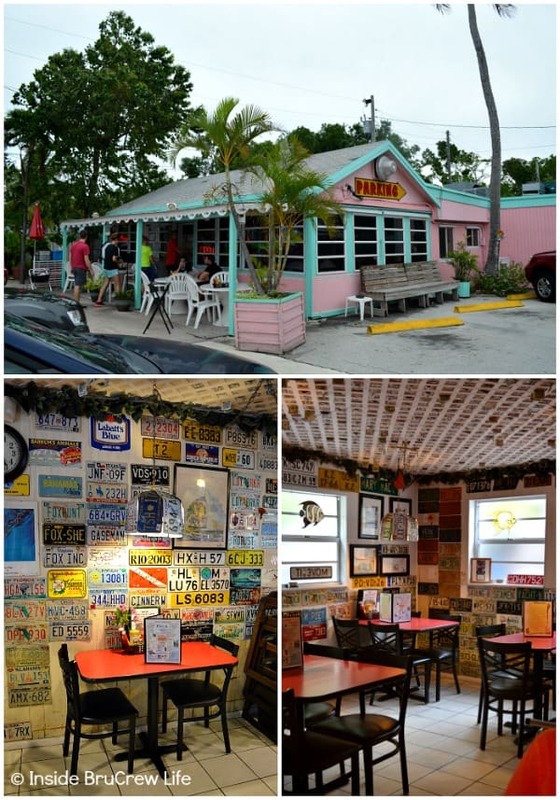 This pretty pink and teal restaurant is just off the highway at mile marker 99 in Key Largo. They serve fresh seafood in a very typical and relaxed Florida setting. The walls of the restaurant are covered in license plates from all over the country and there are dollar bills stuffed in the ceiling. Not only are the walls covered in plates, so are the lights and napkin holders. 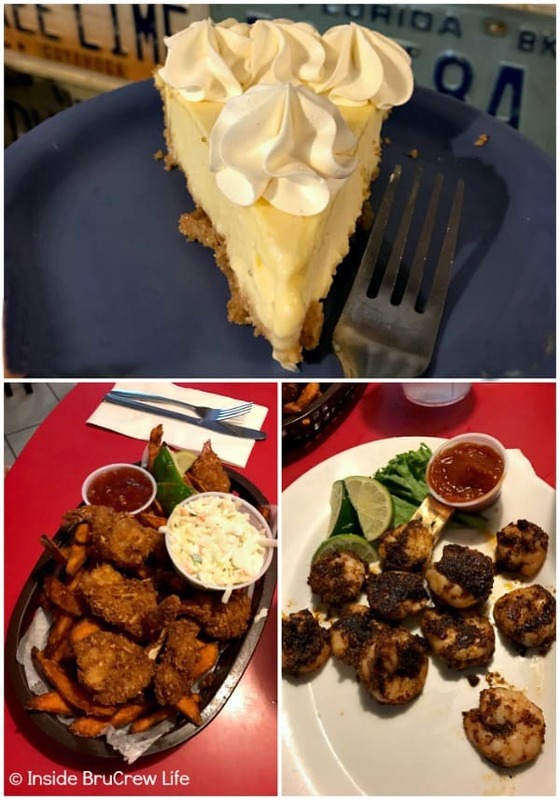 We enjoyed coconut shrimp, blackened shrimp, and of course, a slice of key lime pie. The prices are quite affordable and the food was delicious! 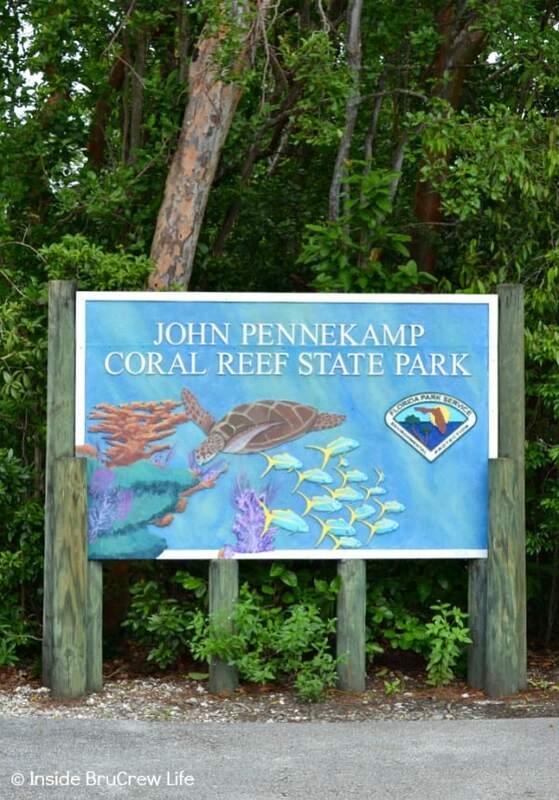 The next morning we packed up and headed to John Pennekamp Coral Reef State Park at mile marker 102.5 for some snorkeling before we headed further down the Keys. 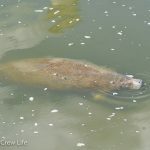 It was still slightly cloudy and rainy but it didn’t stop my husband and oldest son from dropping our paddle boards in the water and heading out into the mangroves where they found a large manatee that was swimming under them. The younger two pulled out the snorkel gear and got in the water to see what they could find while I enjoyed some time on a chair with a book. With the weather not cooperating, the water was murky and dark, so they couldn’t see much out there, but they had fun swimming around. 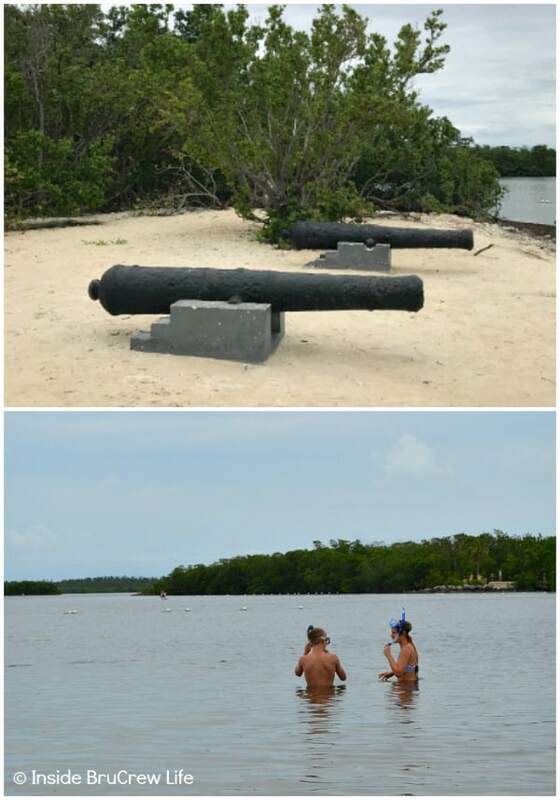 After a while, I put on my snorkel set and went in to find the sunken cannons that were said to be out 100 feet off shore. We found them, but it was hard to see much. After a morning in the water, we were all starving and ready for a good lunch. 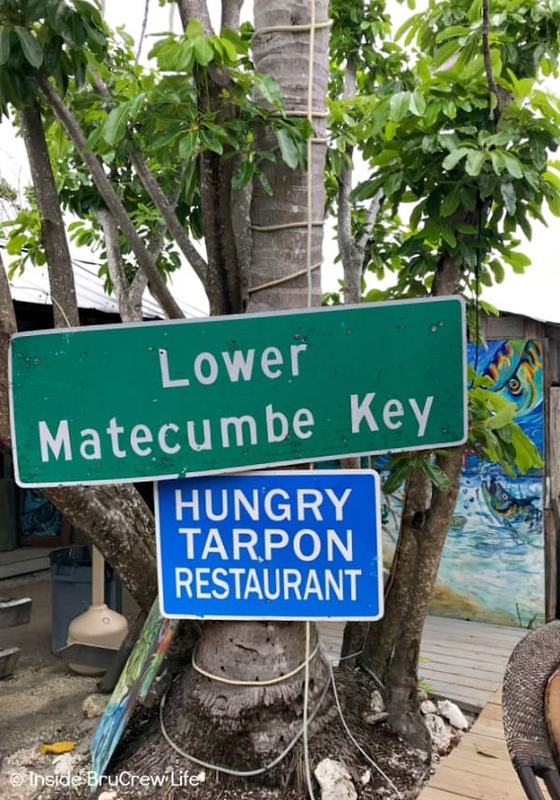 So we headed down the road to the island of Islamadora where we heard that the Hungry Tarpon Restaurant at mile marker 77.5 was the place to stop. 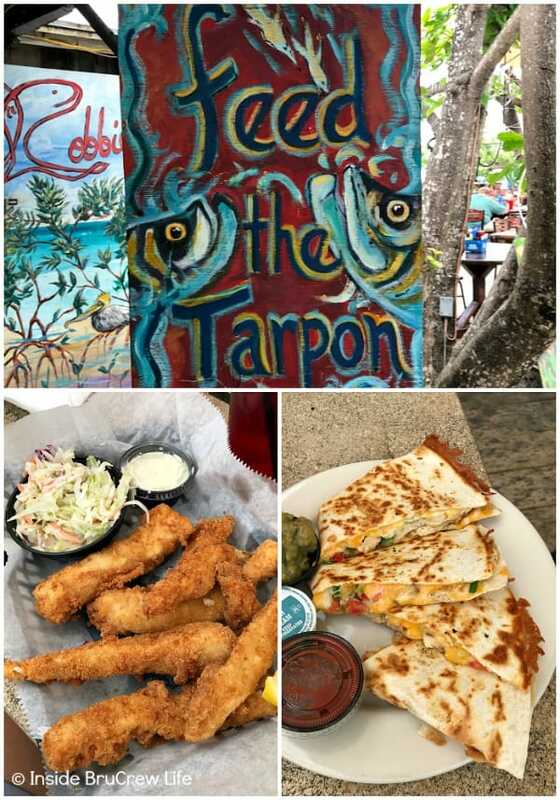 Robbie’s Marina offers a very casual but tropical setting where you can enjoy a delicious dinner, shop some arts and crafts, and feed the ginormous tarpon that swarm along the dock. We enjoyed some the fish basket, some shrimp, a burger, and some cheesy chicken quesadillas. 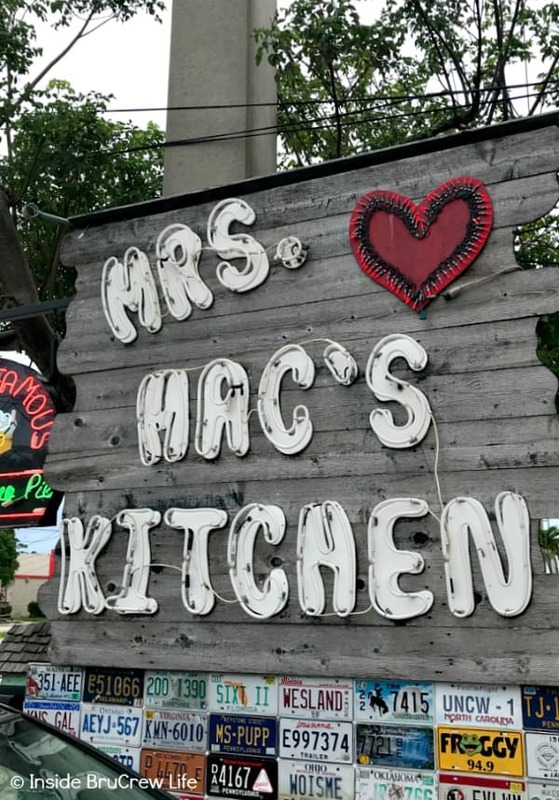 The food was delicious, and I would definitely stop here again if we drive through the Keys again. Of course, after a big meal I wasn’t feeling like eating dessert. Not just yet anyway. I had my eye on a little bakery. Twenty miles down the road we stopped in Marathon at Sweet Savannah’s located at mile marker 51.8. This cute blue bake shop features pie, ice cream, and lots of different baked goods. I stood and stared at all the delicious cupcakes, cookies, and ice cream for what seemed like forever. How in the world can you decide when everything sounds amazing?!?!?! The kids decided to get milkshakes, and I finally settled on an ice cream cookie sandwich. They offer a variety of cookie flavors that you can choose from for your cookie creation. 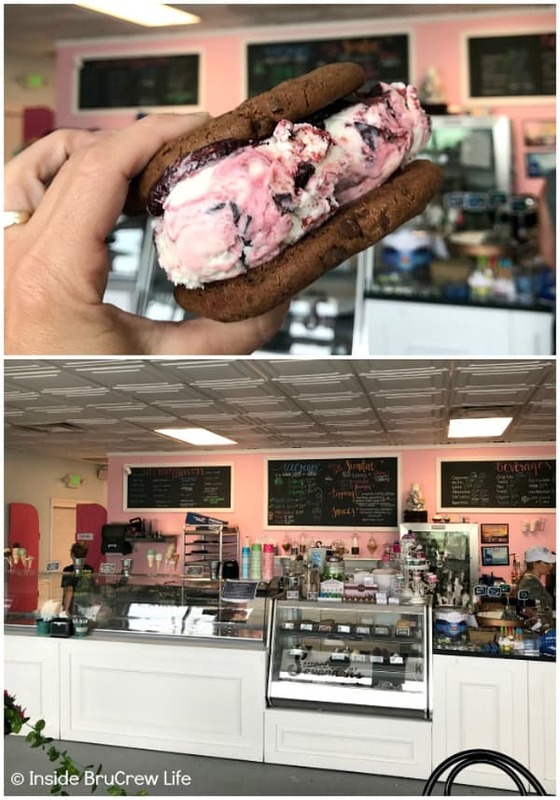 I went with raspberry chocolate chip ice cream between two double chocolate chip cookies. Yup, that is definitely going to be recreated in our kitchen some time soon. Since the weather still wasn’t cooperating, we didn’t stop anywhere else along the way to Key West. 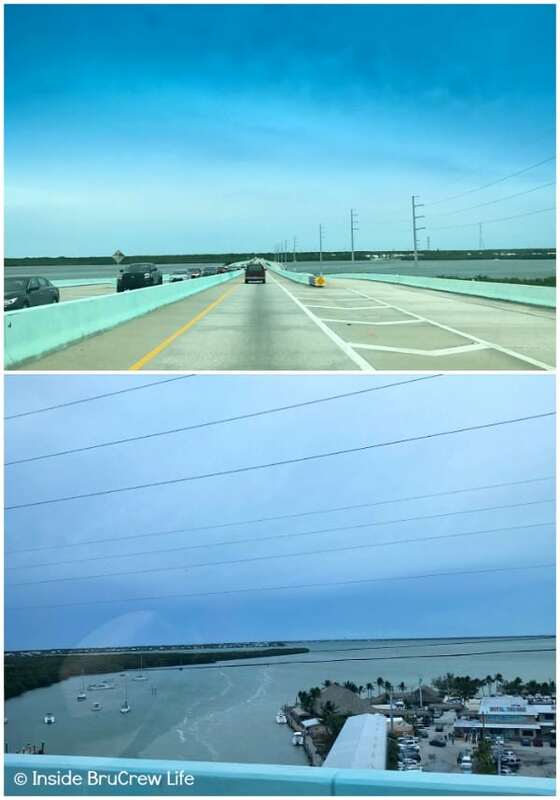 I was really looking forward to seeing the 7 mile bridge but it wasn’t in the cards for this trip. Maybe next time. We got to Key West around dinner time, so we headed out and walked down Duval Street for a little bit before ordering some pizza for dinner. The next morning we got up and headed out for a day of adventure in Key West. I have a bunch of pictures, so I’ll share more later. 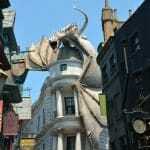 But the one place on my list for sure was Kermit’s Key Lime Shoppe. 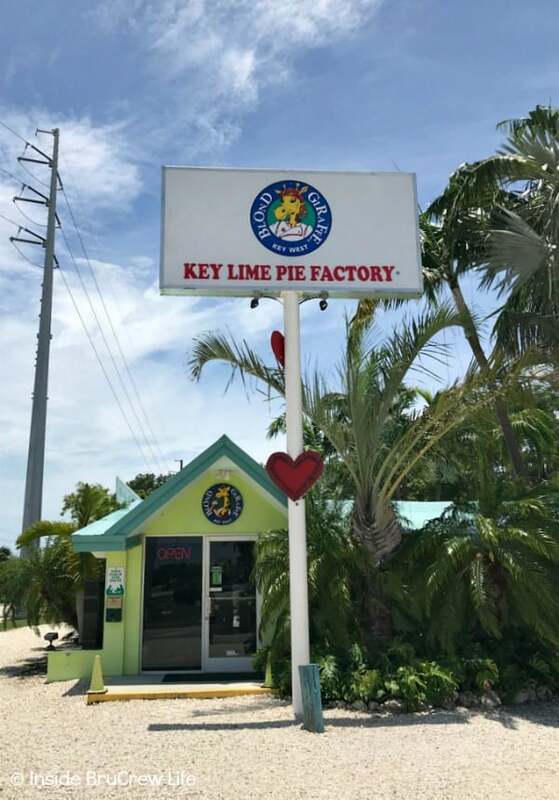 Twenty years ago, my husband and I honeymooned in Key West, and we enjoyed our first slice of chocolate dipped key lime pie. 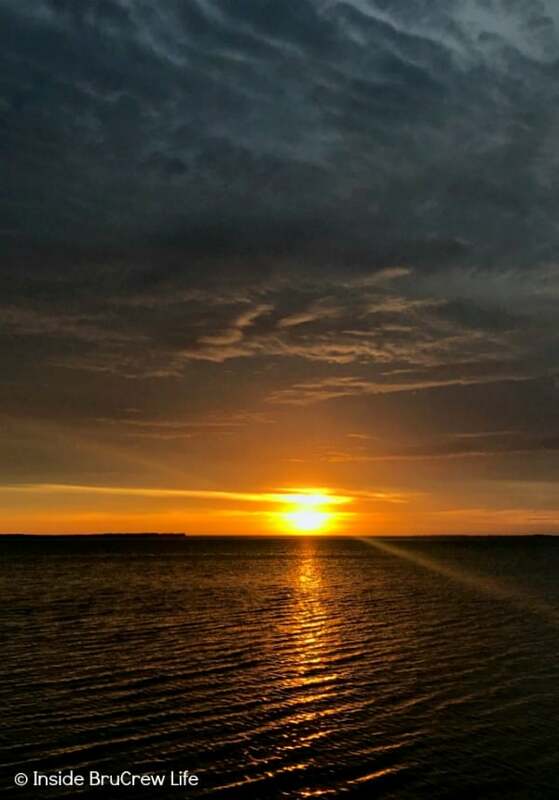 It was (and still is) amazing, so anytime we are in Key West, I have to stop and enjoy another one. 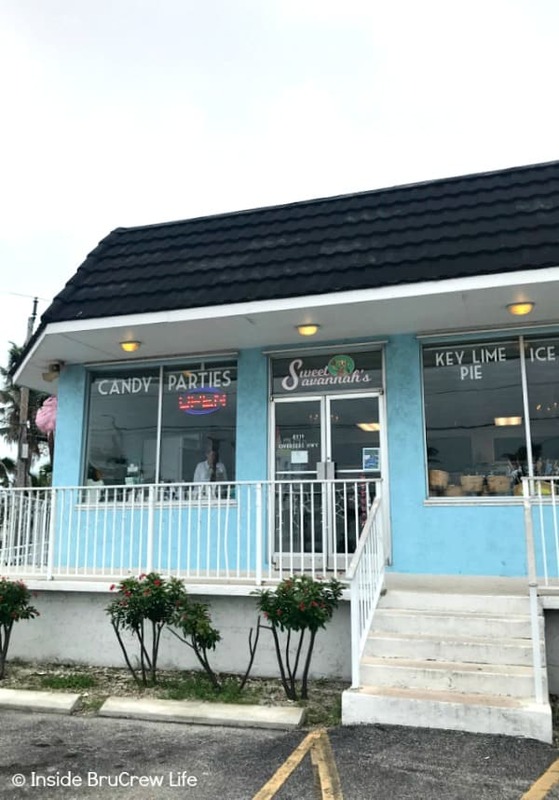 Of course, if key lime pie isn’t your thing, Kermit’s also offers key lime cookies, jelly beans, tea, salsa, olive oil, taffy, and so much more. The next morning we got up and headed back up the Keys because we had a cruise to catch. Of course, along the way I was keeping my eyes open for more fun food places on our Florida Keys day trip. My husband has learned to just pull over without any questions when I point to something. 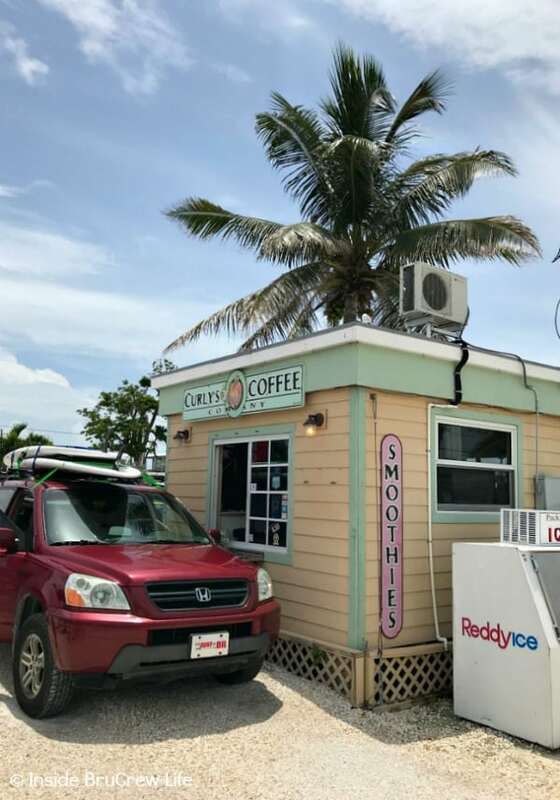 This cute little drive through coffee stand was one of those places in Marathon. 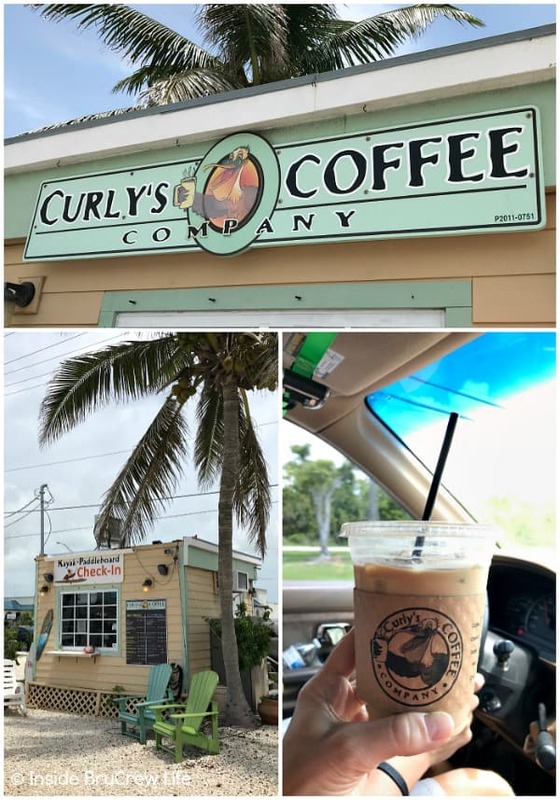 I pointed out the the sign for Curly’s Coffee at mile marker 53, and he pulled over so we could get some caffeine. My iced coffee with a shot of coconut was the perfect cool treat as we kept driving. 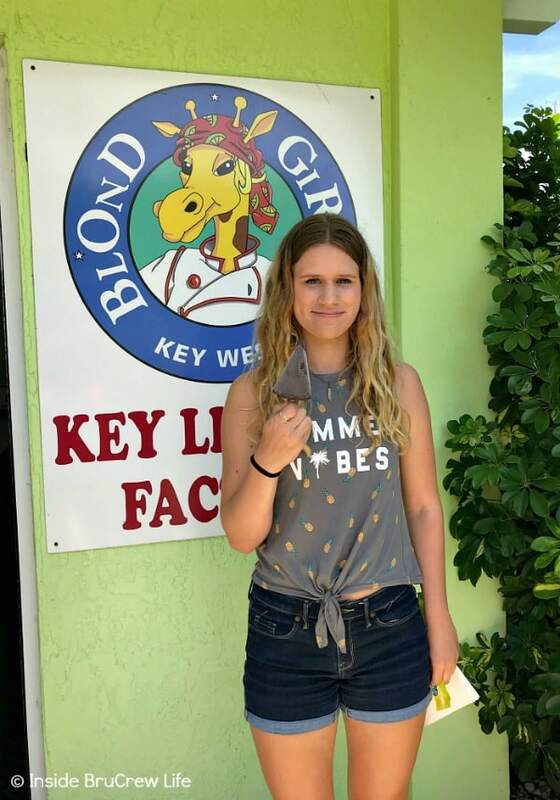 Our last stop on our way out of the Keys was the Blond Giraffe at mile marker 92 in Islamadora. 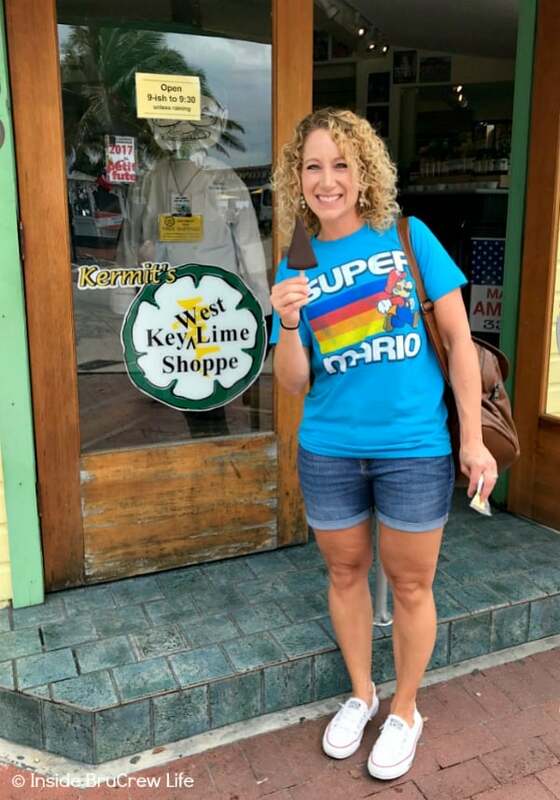 I couldn’t leave the Keys without another slice of key lime pie. The bright green walls of the little island cottage make this such an inviting little stop. 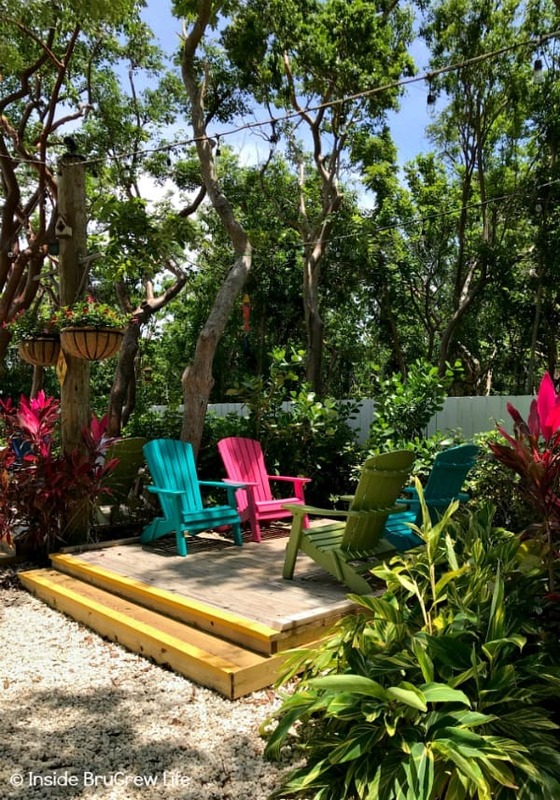 What really sets it apart though is the little garden area in the back where you can sit in colorful Adirondack chairs while enjoying your pie. Their specialty is the meringue topped key lime pie, but chocolate is my first love. So, I went with the chocolate topped, and our daughter went with the chocolate dipped. The little shop also offers around 170 items. 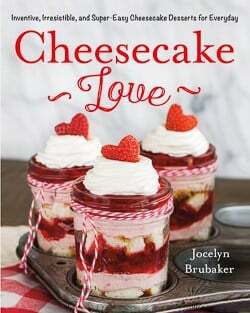 Here you will find key lime in the shape of cakes, cookies, sauces, candies, nuts, and more. Over all I would totally recommend driving the Florida Keys if you ever get the chance. 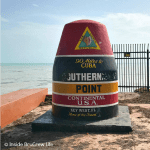 Even when the weather isn’t the greatest, there are lots of Fun Things to do While driving the Florida Keys and plenty of amazing places to eat.